Über-tuner BRABUS claims their Gelandewagen is the most powerful off-roader in the world — and they've got a tuned Mercedes V12 Biturbo with nearly a grand of torque under the hood as exhibit A. Our Mercedes SUV kick since the G-Wagen turned 30 earlier this week was only extended by the RENNtech G-Wagen, a diesel concept from the German tuning haus. And now this! The addition of the 5.5-liter V12 from the Mercedes S600 to a G-wagen by BRABUS is the sort of wild idea you'd respect but, honestly, it's nothing amazing. Mercedes tuners love swapping motors. This is why BRABUS went balls-out and bored out the cylinders and added special camfshafts and a longer stroke crank. And, If you're going to go through all the trouble of increasing the displacement to 6.3 liters you might as well throw in larger turbos and a new exhaust. The result? 690 HP @ 5100 RPM and 973 lb-ft of torque at 2100 RPM. Basically, you've got a a massive Mercedes capable of doing a 0-62 MPH run in 4.2 seconds and dragging the Genva Motor Show to Frankfurt if necessary. The pleasure of owning one of these starts at just shy of $500,000, so this could be the New Depression-era investment you've been looking for. Full details in the press release below. 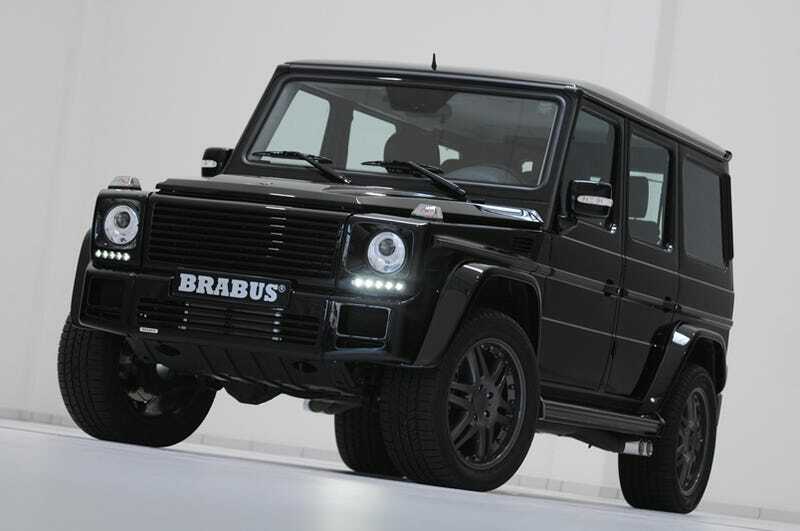 BRABUS G V12 S Biturbo: The world's most powerful off-roader comes from BRABUS (Brabus-Allee, D-46240 Bottrop, phone + 49 / (0) 2041 / 777-0, fax + 49 / (0) 2041 / 777 111, Internet www.brabus.com). It is built by hand based on the latest Mercedes G-Class. The exclusive five-door is powered by a BRABUS SV12 S displacement engine. Like all special models of BRABUS - recognized by the German Vehicle Registration Agency as a vehicle manufacturer - the BRABUS G V12 S Biturbo comes with a comprehensive luxury package. The ultra-powerful 4x4 starts at 379,000 Euros.